Are you a greedy pig when it comes to your money, or are you a gambling socialist, generously distributing your wealth via online slot games? If you’re the former then you will love this pork themed 5 reel. Look out for the debonair pigs in suits, these are the Wilds symbols, and mean your investments are about to produce a significant return. For 20 years, NetEnt has been a prominent gaming software developer. Founded in 1996, they boast an excellent reputation and an astonishing variety of games in their portfolio. NetEnt games and casinos are some of the most searched for in the industry as they provide thrilling and secure games full of cash prizes, it’s no wonder that they are a favourite amongst gamblers. In 2006, their online casino module was voted as one of the top 20 modules, an impressive feat in such a competitive industry. Since then they have stayed on top of the game and continue to expand globally. 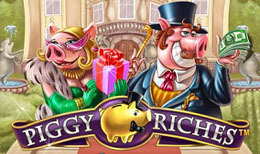 Piggy Riches gives you the opportunity to join these high class piggies at their mansion. These pigs clearly don’t wallow in the mud, or eat the left-over slops from your table, they prefer the finer things in life and have become accustomed to a certain high standard of living. They’re also quite happy to share the wealth with this 5 reel, 15 payline slot game. Piggy Riches is a well thought out and unique game that is compatible with Mac computers, Windows, and Linux systems. Its Flash based so there is no download needed to join the rich and fabulous lifestyle on offer. You can even play it on NetEnt’s Touch platform, making it compatible with your touch screen device. You have a variety of betting options, coin values start at 1p and go up to 50p. Up to 15 paylines can be activated and there are 10 bet option levels to choose from, the bet level will dictate how many coins you can apply to each active payline. Your bet can start from as little as 15p up to £50 per spin when all bet options are optimised. Decorating your reels are quirky and fun symbols that fit in with the theme. These rich and famous pigs like to wallow in Money Bags, Gold Credit Cards, Keys to the luxury pig mobile, Piggy Banks. You also have your classic playing card values, only these are fur lined, jewel encrusted and gilded in gold. Even if their wealth doesn’t entice you, the pigs in Piggy Riches certainly will entertain you. The winning animations and sound effects are very funny which will make you laugh as you win your fortune. Piggy Riches also features Wild and Scatter symbols which increase your winnings when they appear in the right format on the reels. The Mr Piggy symbol is the Wild and he will replace other symbols bar the Scatter to create winning combinations so you get more payouts, all Wild symbol combinations are tripled! Miss Piggy is the Scatter and she will apply multipliers to the total bet amount as well as trigger the Free Spins feature when she appears 3 or more times on the reels. A maximum 28 Free Spins can be triggered with a potential multiplier of 6x is available to a lucky player! The theme to Piggy Riches is fun, quirky, and highly entertaining. The graphics and animations are beautiful and delightful at the same time. You have a good variance in your betting options which means that this online slot game will appeal to anyone from people who prefer low bets to high rollers. This is another brilliant game from NetEnt that will become a favourite.